Special? Yes! When it satisfies the taste buds and it’s easy to make it’s considered special. Although these pops were made some time ago, I wanted to post about them during #popsicleweek. You can mix any fruit in them and any yogurt that you choose. Whatever you end up picking, just remember to share one with a friend so they can cool down with you. If you’re looking for a good popsicle mold I have the Zoku brand at home. You can find it on Amazon. Looking for a healthy way to enjoy summer? Froyo pops are the way to go! 16 ounces Siggi's Yogurt I used the plain drinkable yogurt. You can use any yogurt of your choosing. Once you prep your fruit (wash, slice, measure) start setting up which fruit (and chia seeds if you add them), you'd like in each. *I mixed each pop with random selections of fruits. 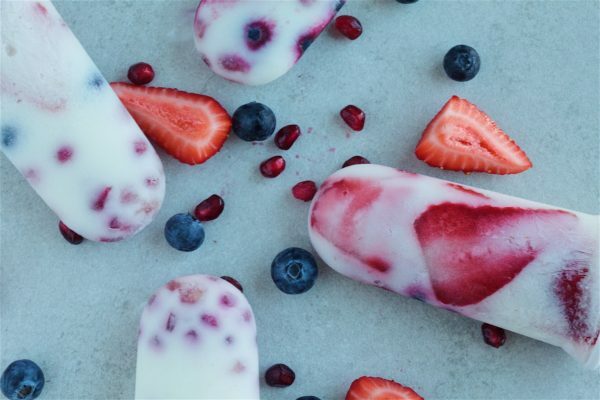 Put some fruit at the base of your icepop holder and then pour in some of the yogurt. Continue to layer until you have reached the top and can seal them to freeze for 4+ hours. Once they have frozen entirely, take them out the mold, take a photo and ENJOY! The Siggi's yogurt has protein in it. This is a great snack for after a workout. It does looks tasty,thank you for sharing the recipe.